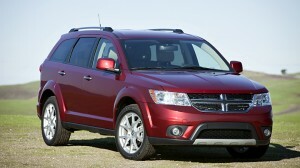 The Dodge Journey is back after listening to all the feedback given and it’s very clear that Dodge took the responses very seriously in the new design. This starts the moment you see the SUV. Sporting a new front grille design and lower front fascia. Other new features include 19 inch aluminum wheels, jeweled LED tail lamps. Bold and muscular line design and with heated mirrors to keep you out of the winter cold to clean them off. It’s all about offering the best value with the best style and never giving up it’s identity. The inside of the Journey is just as revamped as the outside. There’s an impressive level of comfort in the craftsmanship here. The instrument panel is a very rich design with a whole new center console with an improvement on the shifters location and angel. The gear letters were made easier to read and even the cup holder has been raised by 4.2 inches making it easy to get to your drink. If that doesn’t show a dedication to making sure that the Journey is a quality SUV then nothing will. The seats come with additional comfort in the form of an all new comfort foam. They are finely tuned to give the best level of support and comfort to anyone lucky enough to be riding. The seats themselves are offered in a variety of premium cloth and leather. There’s even more knee clearance now due to the center stack being rounded and raised. There’s even an available child’s booster seat that is integrated right into the seat and doesn’t need anymore work then to fold it out. This entry was posted in Bayside Queens, Dodge Journey, New Car, Used Car and tagged Accessories, Bayside Queens, Dodge, New Car, SUV, Used Car by baysideadmin. Bookmark the permalink.